For most companies, data is their most prized possession. If there were ever a total loss of this information, there could be serious risks facing the organization: loss of revenue, decline in productivity, damage to reputation and, ultimately, loss of business. Having a reliable resource to store your information is more important than ever. You can rely on LTO technology. More than a quarter of companies have declared a disaster affecting their data in the past five years and of that, 76 percent have caused major business disruptions. There are a lot of threats that can make your data vulnerable; natural disasters, fire, system error, human error, mirroring errors, viruses, theft, hackers, sabotage, just to name a few. Luckily, LTO tape provides a reliable, offline protection against on-line data corruption. 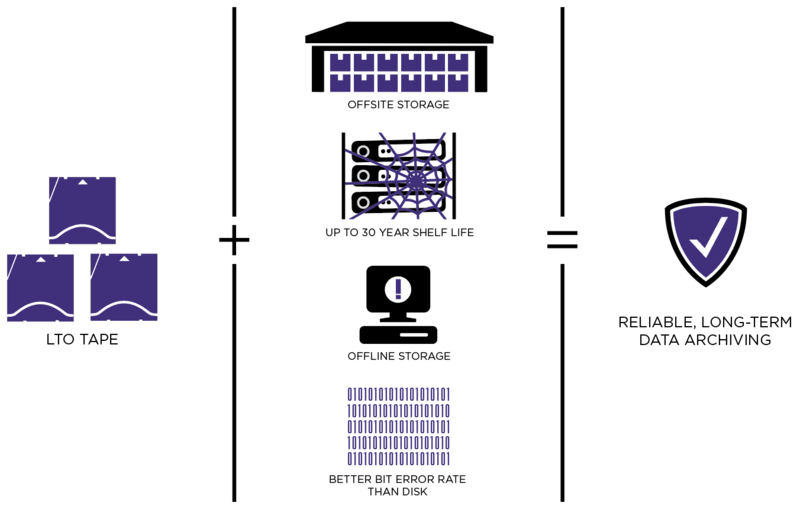 Compared to the shelf-life of disk (3-5 years), LTO tape can withstand the test of time, providing users with a shelf-life of up to 30 years. The protection is also there when you need it, offering a strong error protection and correction algorithm, with an error rate of 1 bit in 1x10E19 bits. That’s four orders of magnitude better than disk, whose error rate is 1 bit per 100 Petabytes. Once your data is written to the tape there’s no need to worry about whether it’s there, it’s immediately verified by the LTO “Read after Write” technology. LTO technology gives you the confidence you need in knowing that your data is there when you need it. As a tape cartridge is kept offline, it’s a great solution for long-term archiving or for data that doesn’t need to be accessed immediately (cold storage). By diversifying your storage practice (disk-to-disk-to-tape being the best), you can ensure that the tape will always be there when you need. Even when disaster strikes. Now that’s something you can rely on.